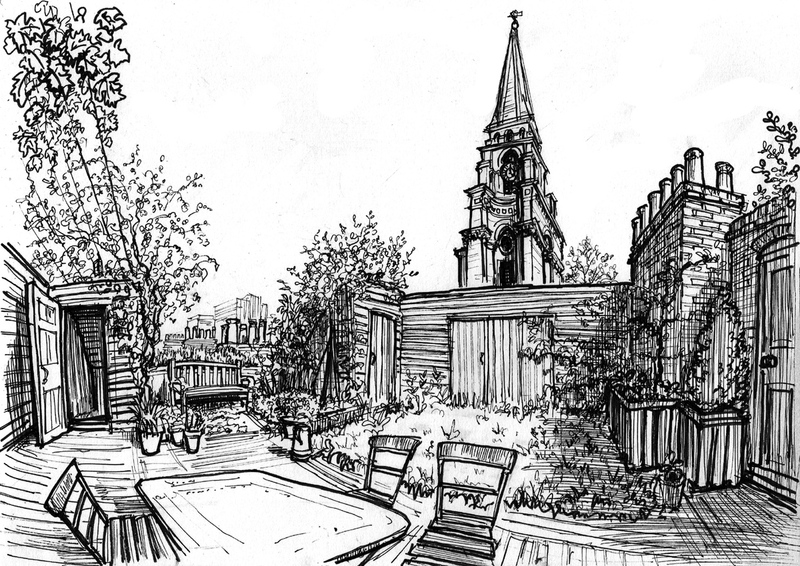 Nestling at the base of Nicholas Hawksmoor’s monumental spire for Christ Church, Spitalfields, is the tiny private roof garden on the top of 3 Fournier St, where what was once planted as a camomile lawn has grown to become a wildflower meadow with pink campions, oxe-eye daisies and sorrel abounding. The pitched roofs on three sides entirely conceal this verdant arbor from the street and create a favoured climate where freesias, carnations, honeysuckle, wallflowers, foxgloves, wild strawberries and lettuces flourish, surrounded by espalier fruit trees and rambling roses, all unknown to those who tread the dusty pavements of Commercial St far below. Built in 1754 by Peter Le Keux, a silkweaver, this elegant old house follows the same Tuscan Order of architecture that was Hawksmoor’s guiding principle, and as you ascend the staircase endlessly winding up to the roof garden, you come upon subtle intricate details, like banisters with square capitals, that match those across the road at the church. 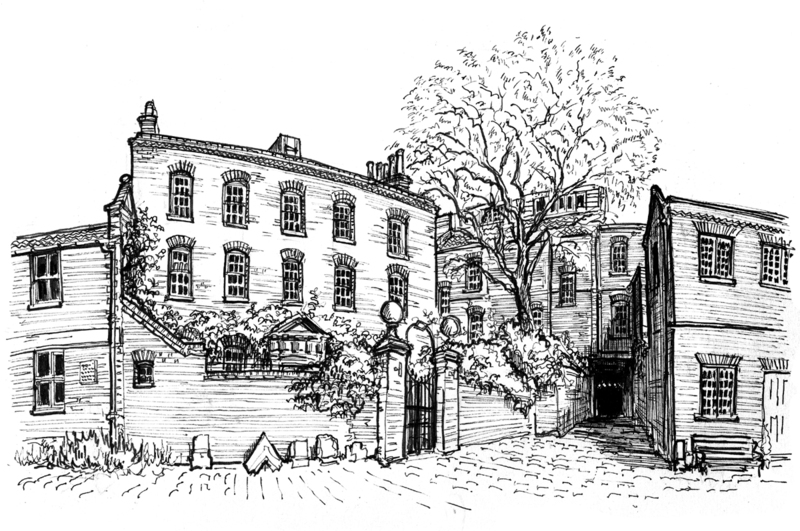 The Worrall House of 1720 is the quintessence of the Spitalfields nobody knows – built in a secret courtyard between Fournier St and Princelet St by Samuel Worrall, the builder responsible for many of the surrounding houses, it can only be approached through a narrow passage behind a heavily-encrusted door. When you step through this door, into the dark cobbled alley lined with ancient planks covered with paint and tar that has not been renewed in over a century, you feel – more than anywhere in Spitalfields – that you have stepped back in time. Here Samuel Worrall built a handsomely proportioned yet modest house for himself in his own builders’ yard. Just one room deep with a pedimented door and stone balls atop the gateposts, it resembles a perfect lifesize dolls’ house. Facing East and constructed of a single layer of bricks, it only receives sunlight in the morning and is not a warm building in Winter, yet there is an irresistible grace and mystery about this shadowy house of enchantment, presiding silently upon a quiet courtyard that is outside time. Joanna Moore’s drawing of Victoria Cottages in Deal St was done upon the spot where Geoffrey Fletcher, author of “The London Nobody Knows,”sat and drew the same view in May 1977, when this terrace was threatened by bulldozers. Built in 1855 by the Metropolitan Association for Dwellings for Housing the Industrious Poor, after the design of Prince Albert’s Model Cottages for the Great Exhibition of 1851, these are one of the earliest examples of two storey cottage apartments. Scheduled for demolition in a slum clearance scheme, they were saved in 1978 through the intervention of Peter Shore who was both local MP and Environment Minister. If Geoffrey Fletcher came back today he would be delighted to step through the old iron gate and discover well-tended cottage gardens where the fragrance of flowers hangs in the air. Pairs of neat white front doors lead either to the ground or first floor dwellings, which, although designed as the minimum in the nineteenth century, appear generous and sympathetic by contemporary standards. 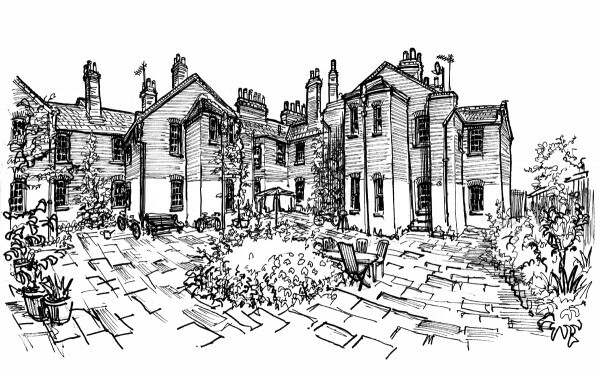 To the rear is a peaceful flagged courtyard where residents hang their laundry, tend the shared garden and hold wild annual parties that are the talk of Spitalfields. Reading this this morning prompted my partner Peter to pull Ian Nairn’s 1966 ‘Nairn’s London’ off the shelf. Such a gloom laden prediction about the future of Spitalfields – bet he’d be thrilled to be proved so wrong. Nice to read something positive about Peter Shore – even growing up in a Labour supporting family in Stepney I was given the impression – probably unfounded – that he was not a good constituency MP. 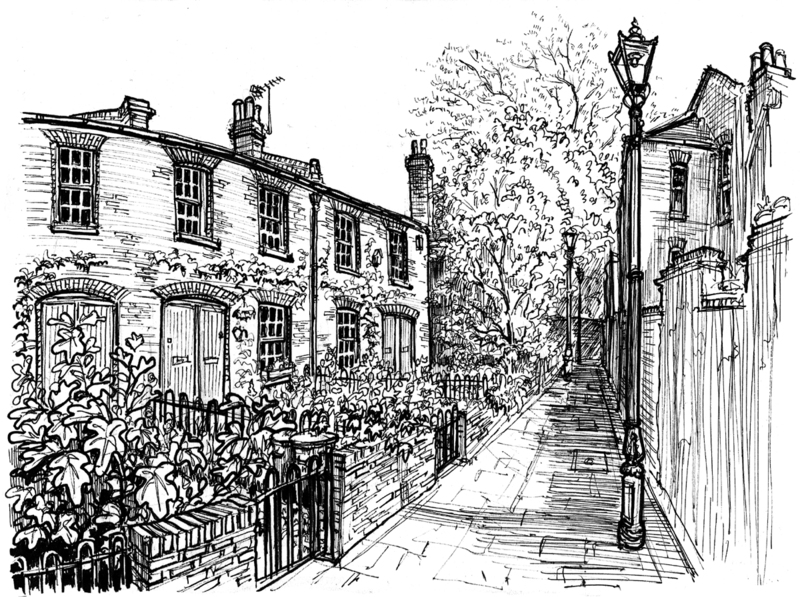 It was Fletcher who made me fall in love with London and want to get to know it better. Even though many things he drew and wrote about are gone, I’m grateful for the record he made of them. These drawings are as expressive and lovely as Fletcher’s. I used to live in Howard Building you also had Albert Buildings that backed on to the cottages in Deal street great memories of growing up there i lived there until they pulled them down i was born in the bedroom of 16 Howard buildings ,as they were called family dwelling you had to have a family member to vouch for you i had at one time 3 aunts 3 uncles 4 cousins my sister and my first wife all living in the buildings also one of my uncles parents and his 2 sisters. I have been researching the Town Hall in Berwick-upon-Tweed. The planning of the present structure was commenced in 1750. The Guild asked George Temple (brother of our Mayor, William) to find an architect to look over some plans drawn up by the Berwick “carpenter”, Joseph Dodds. In October 1750, a record reads, “Mr Worrell the Architect of London’s Plan of a Town house and Steeple being disapproved of by the Committee, and Mr Joseph Dodds’s plan with a portico that is of Mr Joseph Patterson’s Drawing being approved of, It is agreed that Mr Joseph Dodds Shall be the Undertaker” Worrall received some renumeration for his efforts. I am guessing this must be Samuel Worrell. However, another source has written that a John Worrell was involved. I wondered if you know anything of John Worrell or indeed, if any of Samuel’ plans still exist!